Well, we have 12 more days ‘til November 6th! And the polls are open now for those of you who’d like to vote early. I suggest that you do and take someone with you… Get out there and vote now to avoid the lines and to also ensure there aren't any last minute delays that would prevent you from casting your vote. This year’s election is very important. This is not to say that previous elections haven’t been. There’s just so much at stack... You have women’s rights issues, health care concerns, Social Security and Medicare to name a few. 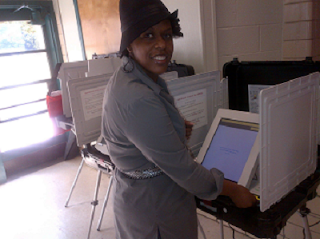 I Exercised My Right, Will You?